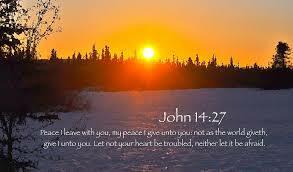 Peace Be Unto You! – Carolina Girls in Action! He says it himself! If he did it, we can too! God did NOT promise us an easy life on earth. But remember to keep that in mind! You are here for a reason. Yeah, yeah, we know. Your boyfriend just dumped you to “work on himself”, you’ve gained 26 pounds in 2 months, your bank account only has 37 dollars in it, your car won’t start up again for the third time this month and now you’re late for work. We know. God knows. We all get it. But you have two choices. Either crawl up in a ball, collecting gray hairs from stress, eating the rest of the tub of ice cream that you just bought 20 minutes ago, or you can let the pain/hurt/lies/bankruptcy go right back out the door that it came in through. You simply have to find your escape route! To find your route or your path, you’ll need a light. (…you see where this is going?) Jesus is the light! Use prayer and faith in order to aim that light on your problems! His light is so bright that the problems will burn away, and you will then have a clear path before you! Remember to pray for other people! Whenever you are going through your darkest times…like all the happiness is sucked away from you, that is when you should begin to pray for someone else. The main times when we are unhappy are when we are stuck in a rut thinking about ourselves! When we begin to stop putting ourselves as the main focus of our lives (sounds backwards, we know) that’s when we are the happiest. Pray for others with a sincere heart. Don’t just say, “God bless whats-his-name”. Pray for them what you would like for your own self! Happiness, Peace, Love, Health, Strength, etc. Remember to keep your mind on God’s love, light, and lessons. Remember that you can do ALL things through Christ! When in times of trouble or hurt, ask God to bring back to remembrance all the things that you have learned from Him. He’ll do it! P.S. We’re interested here at C.G.I.A.. What’s your escape route??? Previous Grab an M&M! (Some Motivation from Monday)!